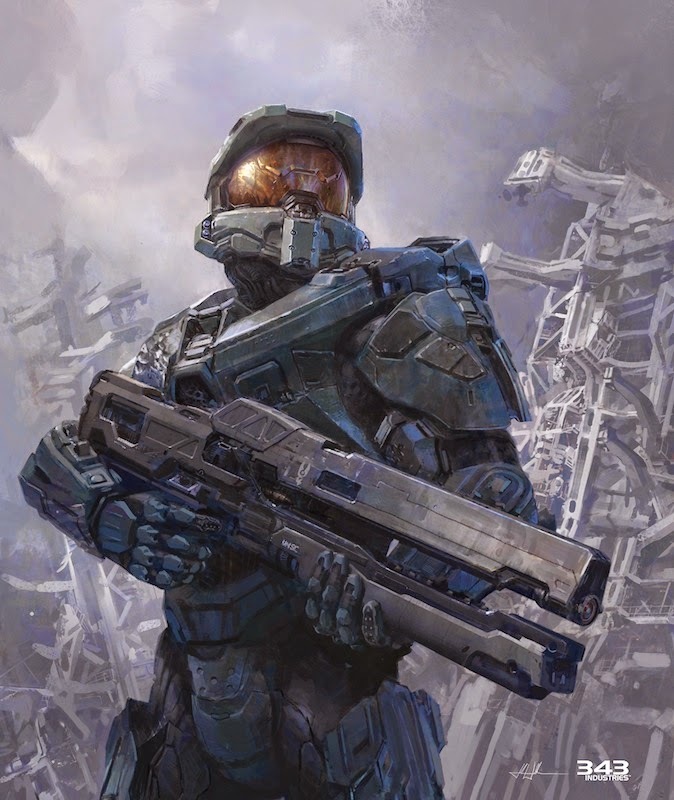 Illustrators now have a new area of illustration they can specialize in called concept art. But that’s not true. It’s not a new specialization. In fact illustrators have been employed by, and assisted, the motion picture industry and other industries from their very beginnings, and stage productions well before that. Now with the explosive growth of motion-based media, concept art is providing more opportunities in the illustration profession to find employment. But that may not be true. According to concept artists, illustration isn’t concept art, and some feel that traditional illustration education doesn’t work when it comes to concept art. But isn’t the creation of an illustration the result of rendering a thought, text, or even a concept? And isn’t the very definition of illustration “artwork that makes something clear and attractive”--concepts included? 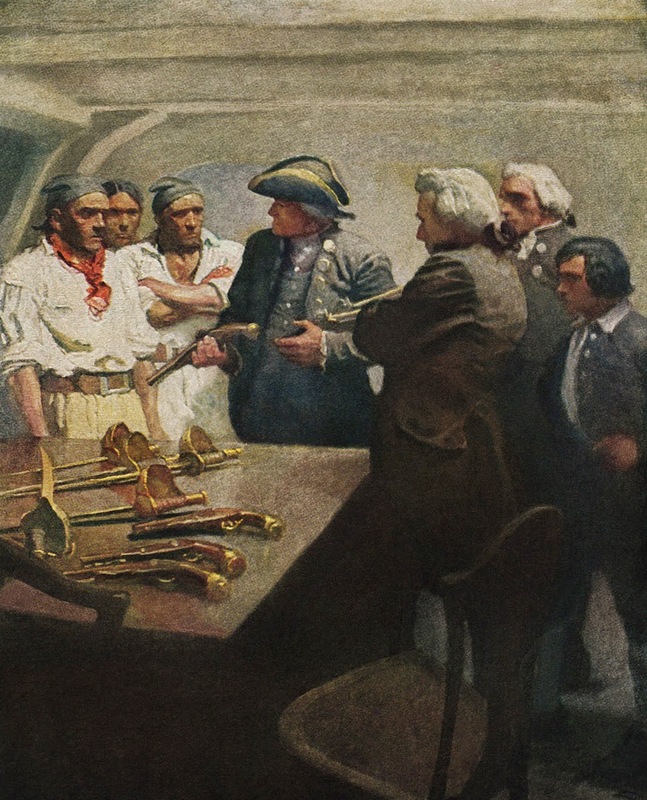 Even though the ideation behind illustration and concept art share common methodologies, and formal artistic skills such as figurative anatomy, pictorial perspective, scene composition, color theory, media application, etc., apply to both, concept artists prefer to separate the field of concept art from that of illustration. To clarify the distinction between an illustration and concept art, concept artists and illustrators, novices and non-practitioners; concept artists focus on two differences to provide a straightforward explanation of their craft. One related to the level of finish and the other related to purpose. It’s within terminology, as it relates to concept art and illustration, the dividing line rests—in the outcome of the artist’s effort. But perhaps the difference doesn’t reside in the visualization process, but in a particular media or product. Or does it? 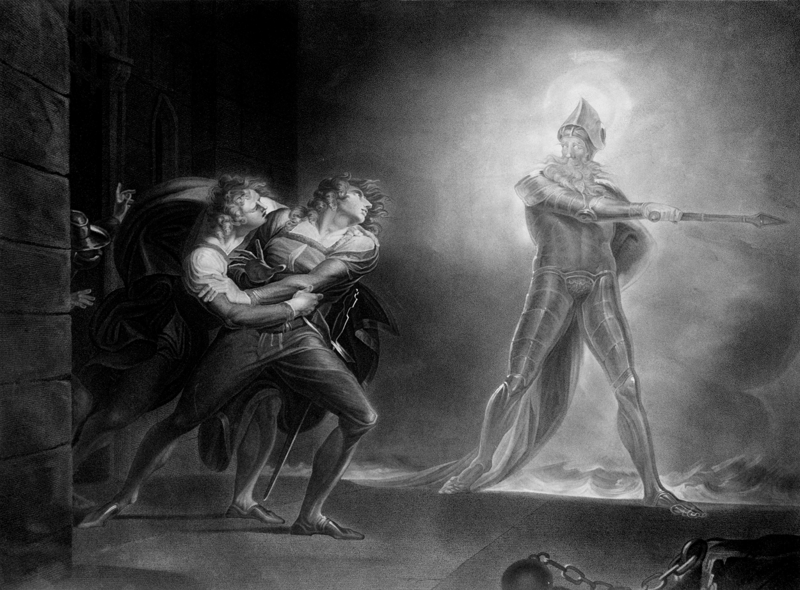 Shakespeare's Hamlet Prince of Denmark, act 1, scene 4. Artist Henri Fuseli, 1796. 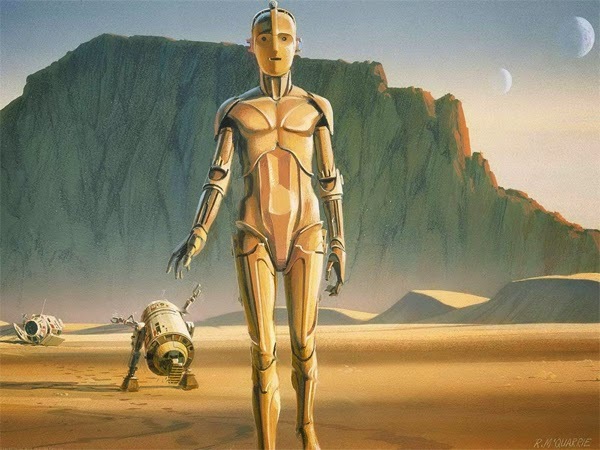 Star Wars R2-D2 and C-P3O concept art. Artist Ralph McQuarrie, 1975. In the 1930’s the Walt Disney Company originated what is now called storyboard art. The process involved producing a visual script for an animated feature. This involved “visual schematics” used to design the look and feel of an animated project. Disney credited animator Webb Smith with creating the idea of drawing scenes on separate sheets of paper and then posting them on a bulletin board to tell a story, visualize a style, an idea, environment, and narrative details as they related to the world within the story. 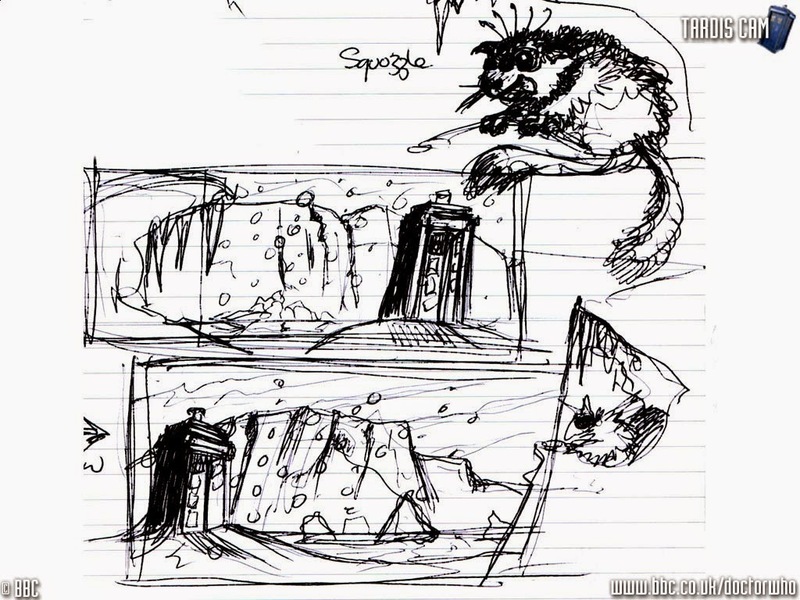 These drawings, a.k.a., “concept art” guided the final production of the animation. Prior to Disney’s storyboard innovation, most animation and film projects produced “story sketches”, which were drawn to illustrate “concepts” that could be incorporated into a production--art created for the purpose of illustrating a vision. Sound familiar? Nearly a century ago artists and illustrators were employed to specialize in creating nothing but concept sketches for production. 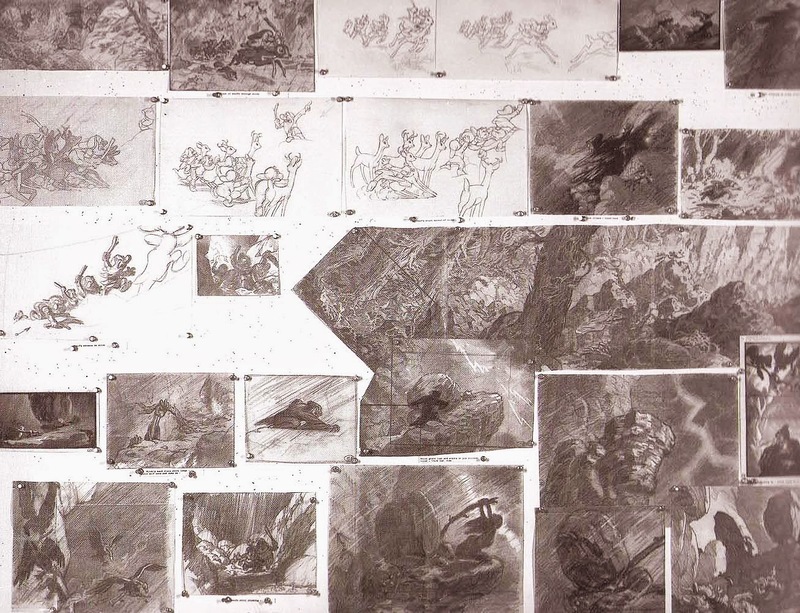 Walter Lantz Productions utilized this approach to their concept art, as did Fleischer Studios, which began in 1921. 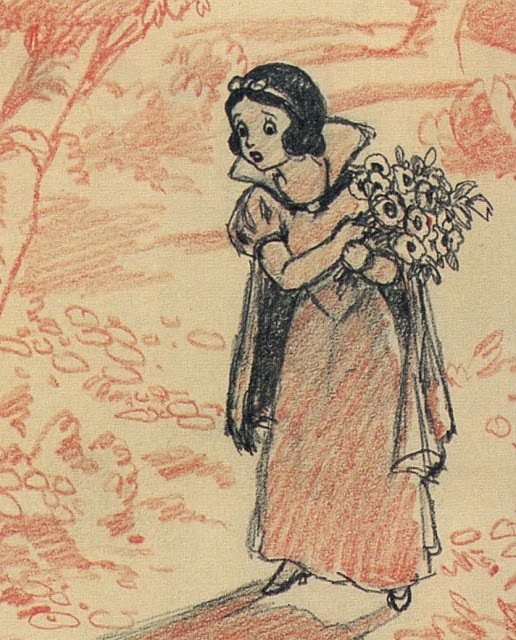 Early concept sketch for Snow White. Artist Albert Hurter. Snow White concept sketch for the evil witch. Artist Joe Grant. An animatic is a pre-production technique using story sketches and/or storyboard drawings to visual conceptual action. Drawings are sequentially displayed for the purpose of visualizing an action concept. An animatic uses cinematic techniques to simulate motion effect. Like concept art, animatics can be rather primitive in appearance, another parallel to the current definition of concept art. Cinematics adds a greater production value to an animatic by utilizing camera movements to create a more elaborate visual finish. Animatics are produced to convey kinetic concepts that involve a scene, idea, and/or an atmosphere. 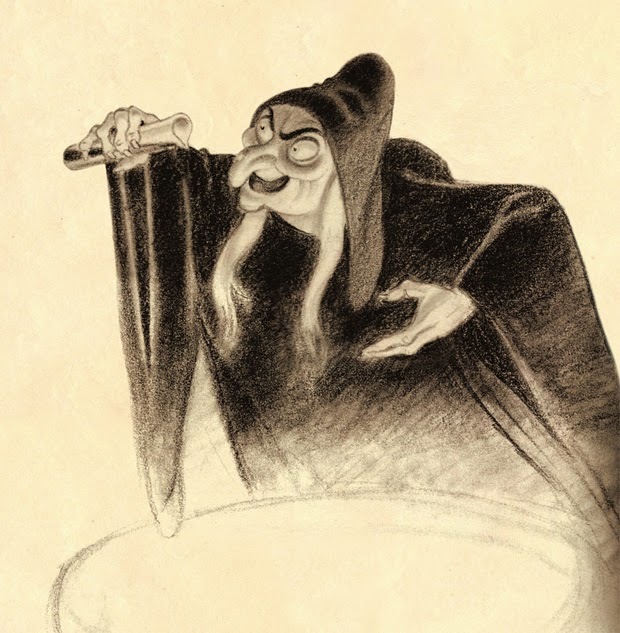 Below is an animatic example by Heidi Gilbert of Walt Disney Studios for the animated feature Wicked. A concept artist is an artist, and relative to the project they are assigned, a visionary, but a concept artist also provides a service. And concept art is a part of a project’s promotion and a part of a service provided. This means that a concept artist’s art may be is expected to do more than provide a concept, and in doing so it may need to be a nice illustration. In fact it may have to be a bonafide “illustration”. And not only does it have to be a nice “finished illustration”, that illustration may have to be used to attract financial backers, influence storyline writers, specify scenic and character details, help develop an audience, assist in project marketing, and much more. Additionally, a main purpose of concept art may even have to demonstrate the talent and skills of the concept artist to visualize a concept. Is concept art a process or a product? Is it an art or not? Are media skills required to execute concept art? Does the idea have more value or does the image? Do ideas evolve during the process of rendering an image? Is there no relationship between the skills needed for concept art and those needed for illustration? If concept art is focused on concept and not finish, can stick figure drawings be an appropriate form of concept art visualization? Do concept artists have to actually draw or produce a visual to be a concept artist? 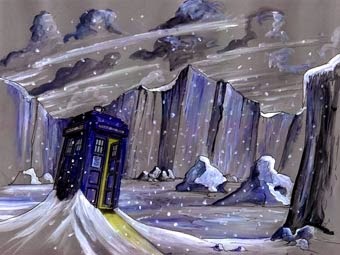 BBC Doctor Who Tardis snow scene sketch with Squozzle. Artist Matt Savage. Snow scene color sketch. Artist Matt Savage. In 1986, the studio where I worked in Dallas was approached by Orion Pictures to provide concepts for assets to be used in the movie Robocop. Gayle Simon, art director, who had worked on Cobra with Sylvester Stallone and later on Die Hard 2, came to me one day and requested we design a gun holster for Murphy, a.k.a., Robocop. Being in Dallas, the crew’s thinking was being influenced by westerns, therefore if a hero had a gun, it must reside in a holster. 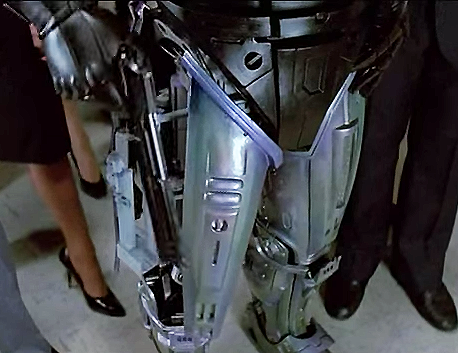 I suggested to Gayle, that as Robocop’s body parts had been replaced by cybernetics, why not just store his gun inside his robotic leg, which could open up to extend and retract the gun, in other words, an internal holster. The concept went to final production. The sketch, which was a crude thumbnail I used to help explain the concept to the art director, was never shown to the production engineers and no longer exists. Here is the concept in production. 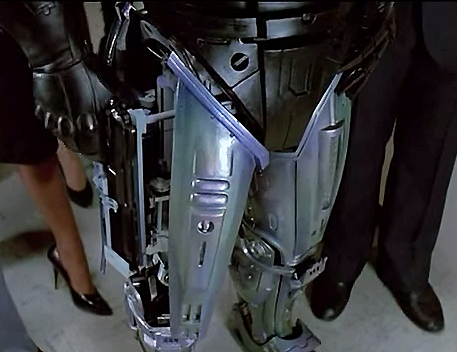 Retracting internal gun holster for Robocop. ©1986 Orion Pictures. Retracting holster, gun in place. ©1986 Orion Pictures. Looking at it from the illustration side, illustration from its inception has encompassed the origination of concept art and predates its current definition and terminology. And, even though there is a movement among educators, and practitioners to diminish the significance of illustration and illustration education, of which the concept art offshoot movement arises, it comes down to this. The ability to draw with skill and accuracy will always be in demand and a necessity. Words and language are wonderful things, but our eyes perceive scenes and objects that are before us. We make our way around our environments with our senses, and our senses demand that we construct a world we can evidence. Illustration serves to elucidate concepts that are beyond what we may perceive, whether it be in books, magazines articles, corporate communications, video games, user interfaces, motion pictures, teleplays, animations, print collateral, public announcements, advertisements, graphic novels, and comics. All that being said there are some notable differences between concept art and illustration. Concept art and illustration can be compared to a set of twins, very similar at birth, but who grow to be less similar as they mature. One main difference is that concept art must take into consideration aspects of an environment, a character’s movement, and assets that relate to a story that exist beyond the snapshot moment in time of the concept art. A good example of concept art, even though a static image, must relate to a story’s history or character’s past, and must act as a transitory image for story elements yet to come. Essentially, it is a visual notation in a context of surrounding conditions, even if those conditions are not yet within the current context of the concept art to be visualized. Illustration doesn’t necessarily have to take all these external mechanics into consideration. Somewhat different, but similar thinking occurs in series book illustration when it comes to creating illustrations in a progressive context. All series illustrations must relate to one another, a character representation must remain consistent, as must the settings, style, environments, and atmosphere. Another difference involves a three-dimensional mindset. In other words, a concept artist must take a worldview of the subject they are visualizing. They must know what unseen elements and environments look like. If the outside of a building is rendered as part of a concept scene, the artist must know how it’s entrance will look from the inside of the building’s lobby, or what the street level entrance will look from the top of the building, etc. Narrative illustration must also make sense in order to trigger the imagination of a viewer or reader of a story to construct the worldview of a text by providing an association to memories and real world situations an audience is familiar with. Or, owing to the illustration are persuaded to imagine. 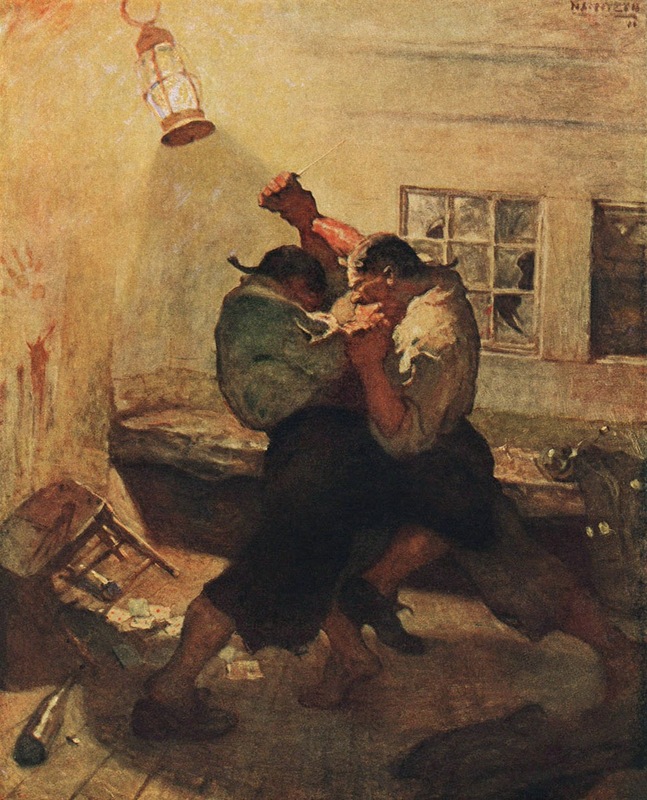 An illustration strives to convince a viewer that the illustrated situation can or did occur. This demands a continuity of all elements that are part of a story to be accurately represented in an illustration. 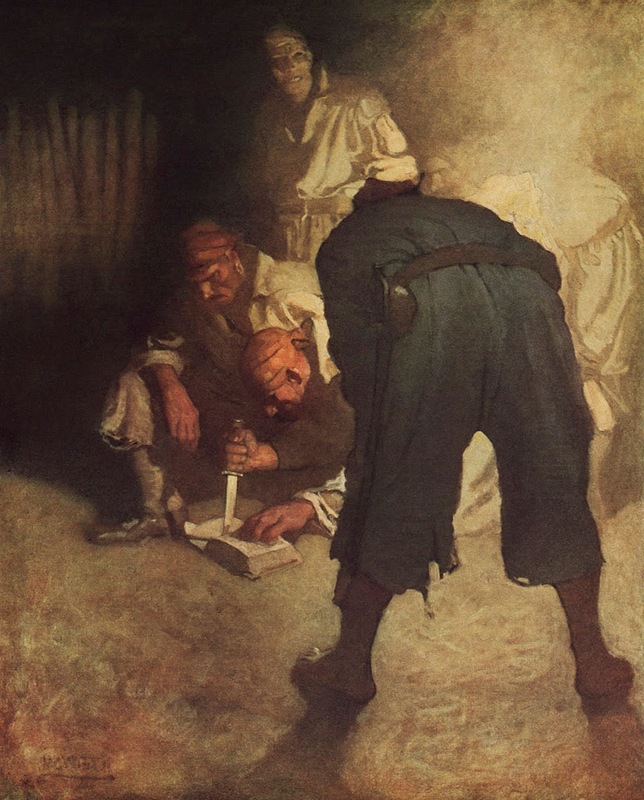 N.C. Wyeth's illustrated series for Robert Louis Stevenson's Treasure Island below serves as an excellent example. "The boarders swarming over a fence like monkeys." deadly wrestle." 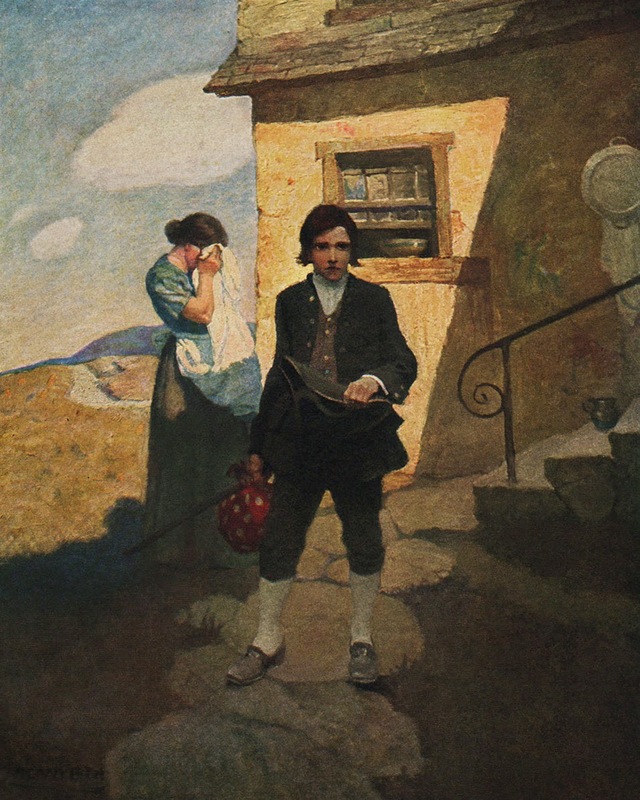 Artist N.C.Wyeth, 1911.
brains out." 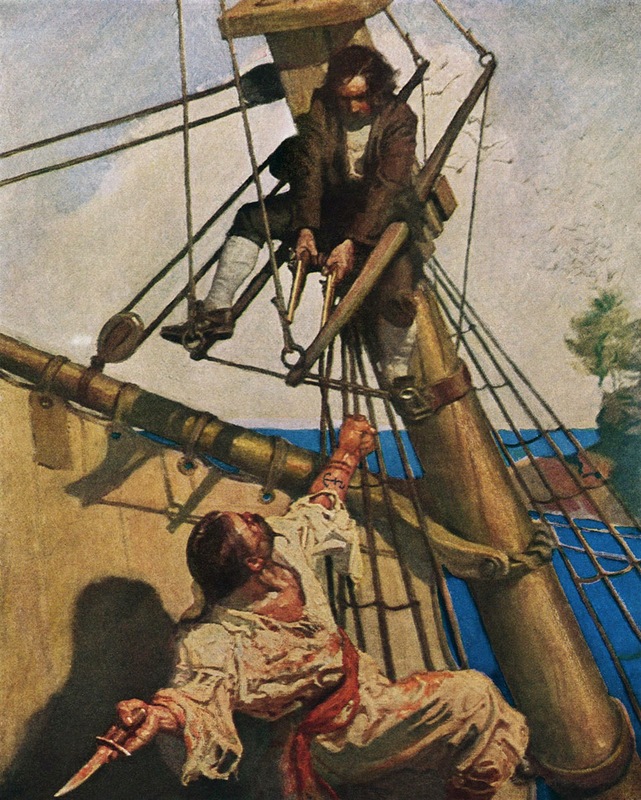 Artist N.C.Wyeth, 1911.
collected in a group." 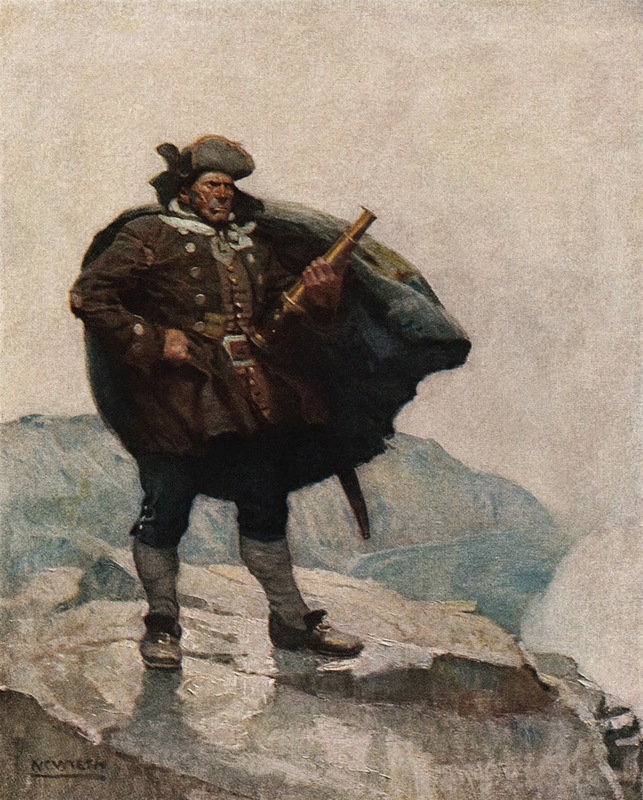 Artist N.C.Wyeth, 1911.
brass telescope." 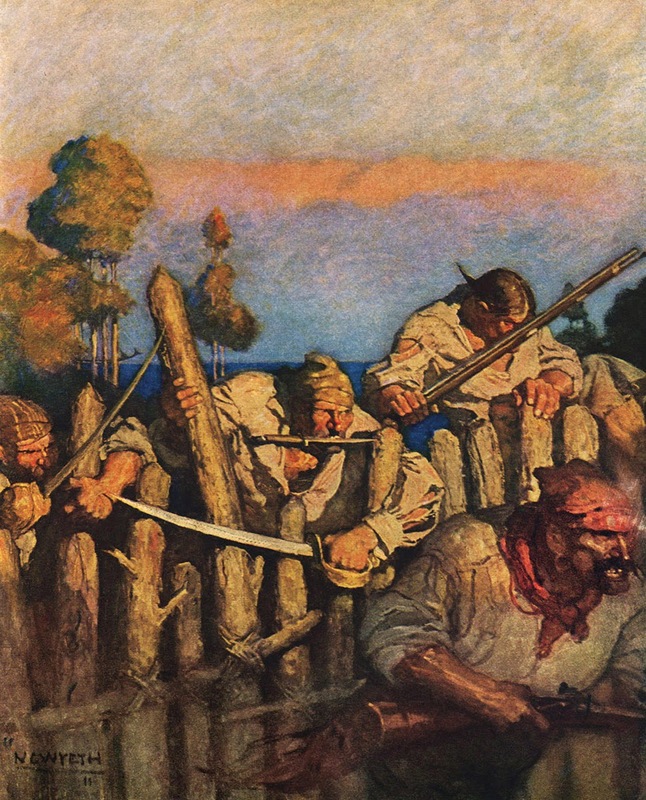 Artist N.C.Wyeth, 1911. "I said goodbye to Mother and the cove." "Loaded pistols were served out to all the sure men."